I very rarely take the stage. You have probably noticed, I very rarely take the stage. But the draw, the Knockout Stage of the UEFA Europa League, sees us face Athletic. So when I was offered to write this post, I accepted. Because, beyond the titles won and beyond the years spent in this club, there have been single meetings and events that have forged me into the player I have become and the man I am still. In each club where you play, there is a common element: Passion. The passion you have for your club. The passion that surrounds your club. The passion that your club conveys. As in Marseille, and when you live in Bilbao, from Monday morning you start talking about the next match. At Athletic, there are still a lot of unique cultures. The best known is that all players who wear the colors of the Club must be Basque. I was born on October 23, 1961, in a small village in the province of Gipuzkoa, in the Basque Country. Since then, my heart club has always been Athletic. I was already a goalkeeper. 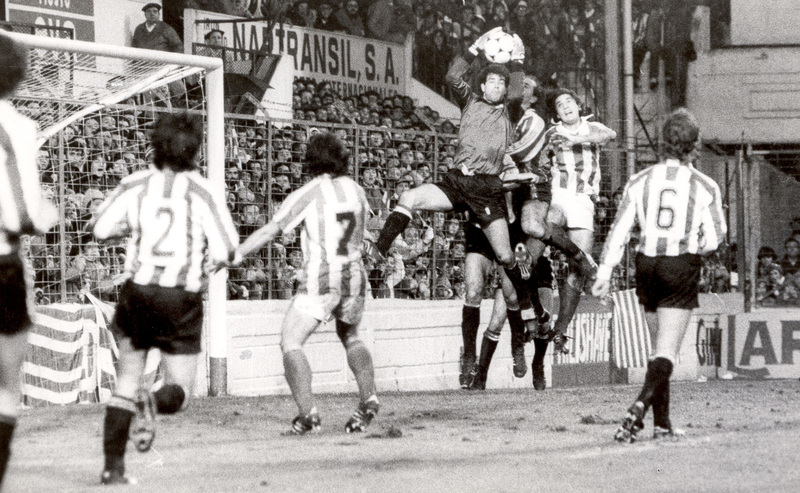 The Basque Country has always been a breeding ground for great goalkeepers. This position – also unique – seems to be in the DNA of this region. At 18, while playing for Deportivo Alavès, FC Barcelona wanted to recruit me. Athletic too. My choice was simple. One of the reasons, but not the least, that pushed me to join the club was: José Angel Iribar. 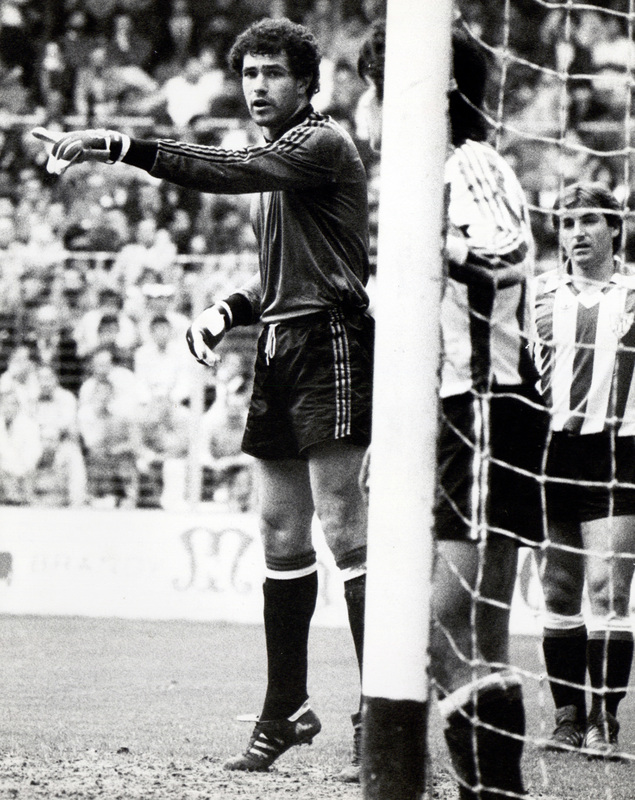 He was a historic keeper for Athletic. He has been a source of inspiration for me. I was a fan. To the point of wanting to become a professional goalkeeper myself. When I arrived at Athletic, I seized the chance I had to work alongside such a player and meet such a personality. We have established close ties and we have always kept in touch. He celebrated his 75th birthday last week. We spoke on the phone. Iribar was the coach of the first team goalkeepers and youth sections. It was a momentous and unforgettable meeting for me. He was the keystone, the thread of my career, in many ways. I remember his workouts. I also remember sharing meals with him. For two hours we ate together and talked a lot. About football in general, the goalkeeping position in particular. We were a group of 4-5 ‘keepers. These meals were always filled with exciting anecdotes from each other. He told us about his experiences. We were still far from the media hype that football currently experiencies. He told us his way of seeing life in general. How could one live well as a player while being fulfilled from a personal point of view? It was very rewarding. For the footballer and goalkeeper I was. For the man I was becoming. We do not work on excuses. We work on the problems. From these exchanges I remember several things: the most important is to make all the things you say you want to do into a reality. This is our “Basque” side. In the Basque Country, we are quite pragmatic. If we decide to do something, we give ourselves the means to achieve it and we go for it. There is no great speech. There are no beautiful words. You have to be in action. It does not matter if we make mistakes. You have to be an actor. You have to try, try and take risks. Only action counts. We do not work on excuses. We work on the problems. It is a course of action that Iribar instilled in me. We grow up when we recognize the problems. That’s what I’m trying to do, even today. My first appearance at the pros was pretty unexpected. It was during my military service. I did not train until the afternoon. I did not see the First Team. There was a strange situation at the time with a strike of the championship players. I was called on a Thursday night to take part in a meeting where I was told that I was going to be playing on Saturday. We were facing Atletico Madrid. The match was televised. At the time, this added additional pressure. We lost 2-0. At the end of the season 1980-81, the coach of the reserves was promoted the first team. It was Javier Clemente. He decided to take several players from the reserves with him. 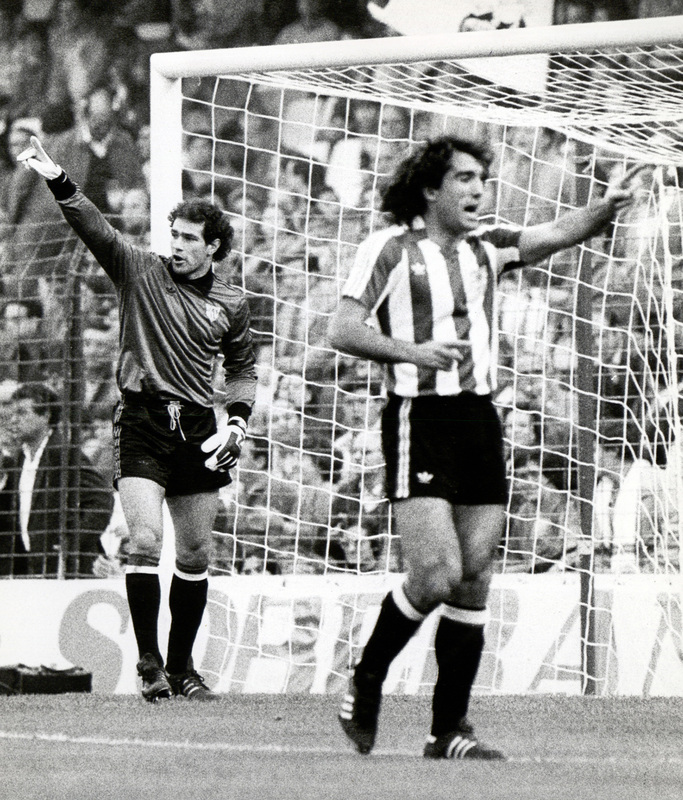 For the goalkeepers, it was Iribar who made that decision. He bet on me but also on Andoni Cedrun, the son of Carmello Cedrun, also a professional and also a goalkeeper. I was the incumbent and I kept that status. A club where you have to play with heart. When I arrived at Athletic, I knew my qualities. I was already developing through national team youth selections. But alongside Iribar, I evolved. I learned what high standards and professionalism meant. He also told me about the importance of football in the special city of Bilbao. Athletic is a historic club. The only one, along with FC Barcelona and Real Madrid, that has never played in the second division. It’s a club where you have to play with heart. Whoever your opponent, you have to play to win. It’s also a cultural issue. In Bilbao, an industrial stronghold, we are dealing with very hard workers. No one is surprised to see people coming into work at 7 a.m. This investment and taste for work, you find it especially when you wear these colors. That’s why the frenzy for this club is so special. We support the First Team as much as the other club teams. It is not uncommon to see youth games or women’s matches played in front of 25,000 fans. We value everyone, we are interested and we salute the work of all the club’s teams. A unique moment I will never forget. 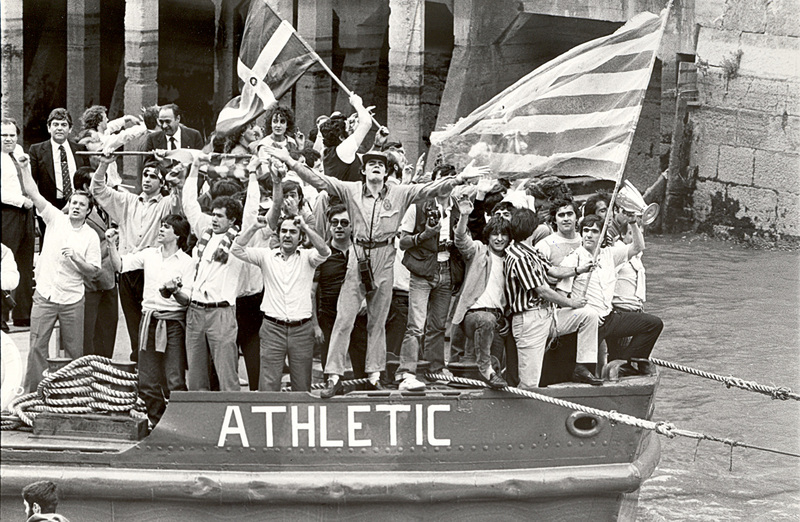 Of all the titles won with Athletic, the first has a special meaning for me. Everything was played for on the last day of the season. Real Madrid FC faced Valencia CF and we faced Las Palmas. Real was renowned for never losing late in the game. They lost, however, in the final seconds of play, while we rolled to a score of 5-1. I then remember a note from Piru Gainza, Javier Clemente’s right hand man: “Guys, you do not realize what you’ve done yet, but tomorrow you’ll see!” And indeed, we saw! Upon our return to the city, a huge crowd was waiting for us at the airport. In the streets of Bilbao, there were millions of fans, some traveled from far away. Young people, old people, families. The whole community. It was a unique moment that will remain etched in my memory forever. Especially since it was also on this occasion that I could see that the club was component of social cohesion. In the 1980s, the political climate was appalling in Spain and the Basque Country. Attacks multiplied. Yet when the Atlhetic was playing, there were only supporters united and gathered around the same badge. 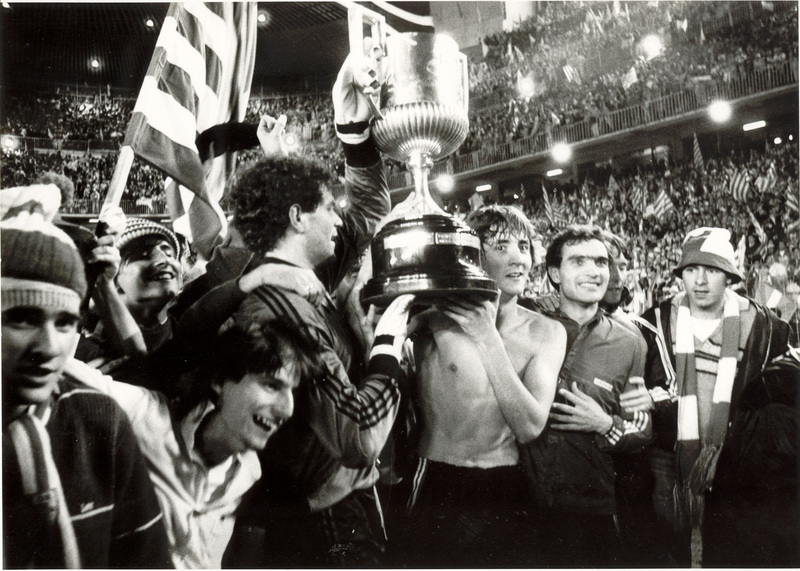 This fervor was similar the following season during the double Cup / Championship triumphs. It continued in time, even when the club lost. In 2012, when Marcelo Bielsa was leading the team, Athletic finished sixth in the Liga, lost in the UEFA Cup final and in the final of the Spanish Cup. The fans were keen to congratulate the group after the nice run. There is recognition and unwavering support from the public, in the good, but also and especially in the bad times. Guys, you still do not realize what you've achieved, but tomorrow you'll see! In 1986, my situation was both simple and complicated. I did not have an agent. My contract expired at the end of the 1986 season. In my head, I had no doubt: My adventure with the club was going to continue naturally. However, FC Barcelona wanted to sign me. The Catalan leaders came to see me and told me of their desire. I then told them to speak directly with my Athletic leaders. They were very surprised considering that I was free contractually: “Andoni, why should we start discussions for your transfer when you are at the end of the contract?” But for me, it was inconceivable to do otherwise. So Barcelona made the first steps. I was calm and certain that they would get a firm “No”. But here it was not the case: “We need money Andoni, you have to go to Barcelona”. And the transfer was made. To transfer a free player from any contract is pretty rare, right? I do not think football has seen many similar cases. Why should we discuss your transfer when you're out of contract?